As detailed in my recent color explainer, the Pixel 2 and 2 XL have a default method of displaying colors in a limited color space. Google’s software doesn’t include an option to force a wide gamut, so I created an app that does it. You can download the new Oreo Colorizer right now, and you don’t even need to root your phone. Oreo Colorizer is an app that can force your device to shift from using the standard color space to a wide color gamut. 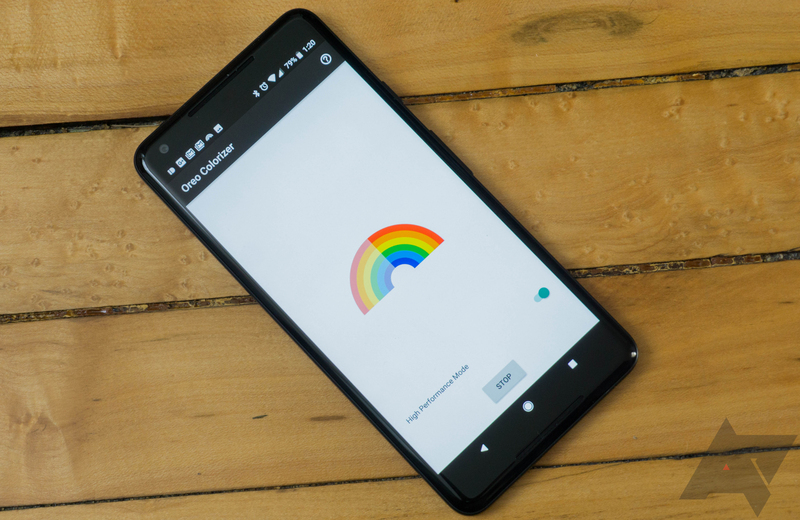 On the Pixel 2 and 2 XL, this means colors will no longer display at just sRGB, but instead with the DCI-P3 color space. This works in all apps, as well as on the home screen. Oreo Colorizer uses an invisible system overlay operating in wide color gamut that forces the display to shift its color space. Included are two operating modes: Standard and High Performance. Standard Mode is a completely passive implementation that only updates when something on the screen updates. High Performance Mode forces the display to shift color space every frame. Apps that use SurfaceViews and video playback may require this mode. See it in action below—keep your eye on the rainbow and the tree. You can download Oreo Colorizer from APK Mirror. Just enable unknown sources for your browser and sideload the app.